where two protons collide to produce a Higgs boson. 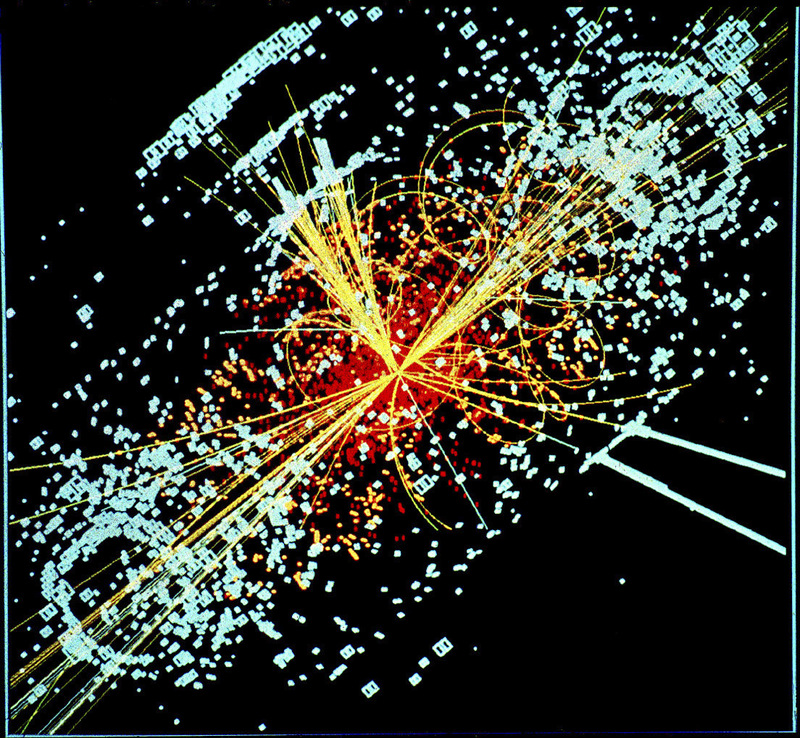 Recently, there has been a lot of chatter amongst physicists about the Higgs boson. But what is it? In 1964, a physicist named Peter Higgs proposed the existence of an energy field that permeated the entire universe. We now call this energy field the Higgs field. The reason he proposed this field is that nobody understood why some subatomic particles were very massive while other had little or no mass. 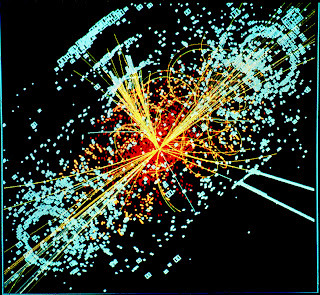 The energy field that Higgs proposed would interact with the subatomic particles and give them their mass. Very massive particles would interact a lot with the field, while massless particles wouldn’t interact at all. To better understand the idea we can use an analogy of swimmers in the ocean. If we think of the ocean as a Higgs field, then a fish, being streamlined, only interacts slightly with the field and can move through it very easily. A fish, therefore, would be similar to a low-mass particle. In contrast, if you or I were to try and swim through the same water, we would move much more slowly. We would represent a massive particle because we interact a lot with the water. The lightest of the subatomic particles is the electron, and the heaviest is the top quark, which weighs about as much as an entire gold atom, or about 350,000 times more than the electron. The thinking is not that the top quark is more massive because it is bigger. In fact, it’s the same size as an electron, but more massive because it interacts more strongly with the Higgs field. If the Higgs field didn’t exist, neither of these particles would have any mass at all. For some reason, we don’t hear much about the Higgs field, but rather the Higgs boson. The two are related because the Higgs boson is the smallest part of the Higgs field. We can use our water analogy to understand this better. We all know what water is. If you are in the ocean, you know that water is a continuous medium that is all around you. We also know that water is made of molecules. Once you realize that water is composed of countless water molecules you can begin to appreciate the Higgs boson. The Higgs field consists of countless Higgs bosons. Keep in mind that the Higgs boson has not been discovered yet. Even so, physicists are currently studying data taken from particle accelerators such as the Large Hadron Collider at CERN, in Geneva, Switzerland, and we should have an answer soon. If it is confirmed we will have the final piece of the jigsaw puzzle known as the Standard Model in place. If not, well, then things get really interesting! Nice Post! I like this type postings.